Physicist and humanist. His father was a reformed minister, his mother, Maria Jansson, was a relative of the Amsterdam printer Jan Jansson. After studying in Utrecht, where his teachers included Johann Georg Graevius, de Vries, Johann Leusden, Johannes Munniks and Jacob Vallan, he obtained his doctorate in 1681. He taught Greek and History in Hardewijk in 1697, and from 1702 was also appointed to the chair of medicine. 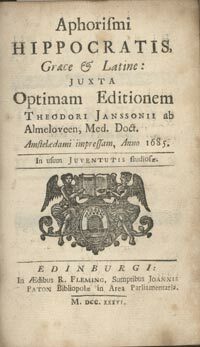 In his book Inventa Novantiqua (1684), he affirms the superiority of the ancient physicians, claiming that they anticipated all of the discoveries later attributed to the moderns. Main works: De Vitis Stephanorum (1683); Inventa novantiqua (1684); Aphorismi Hippocratis (1685); Opuscula, sive Antiquitatum è sacris profanarum Specimen (1686); Amoenitates Theologico-philologicae (1694); Epigrammata vetera (1694); Plagiariorum Syllabus (1694). Bibliography: S. Verheesen-Stegeman, Patronage and services in the Republic of Letters: the network of Theodorus Janssonius van Almeloveen (1657-1712), Amsterdam, Apa-Holland Universiteits Pers 2005. Bibliotheca Almeloveeniana sive catalogus elegantissimus librorum in omni studiorum genere rarissimorum ... quos magno studio et sumptu dum viveret collegit et usus est viri celeberrimus Theodorus Janssonius ab Almeloveen horum omnium fiet auctio ad diem 25 Aprilis 1713, Amstelaedami, Wolters 1713, 284 S.